The Class of 2021 was officially welcomed to Western Law at an Induction Ceremony held at Western University’s Great Hall on September 4. The ceremony, now in its third year, marks a significant milestone in the professional and academic lives of the students. 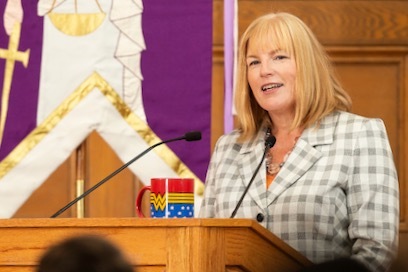 Dean Chamberlain told the incoming class that “lawyers play a fundamental role in sustaining our modern democracy – and it will be your job, as future lawyers, to ensure that the principles of justice do not get lost amidst popular opinion, political pressure, or media representations. “We will help you to build that professional identity, so that when you enter practice, you will have the courage to defend the values that inspired you to apply to law school in the first place,” she said. 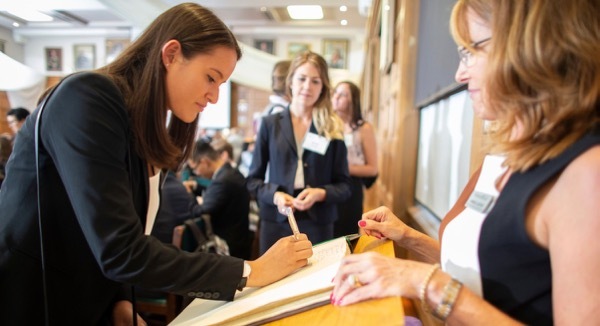 Madam Justice Jeanine LeRoy of the Ontario Court of Justice delivered an inspirational keynote address and spoke to the Class of 2021 about their role as legal professionals. “Your integrity and reputation are all you have on this road to being a member of the legal profession,” she said. “They are easy to lose and hard to regain. Put another way...it takes time to develop a good reputation, but only a moment to lose it. Guard both your integrity and your reputation. They are - and always will be - the most valuable possessions of your career." She encouraged them to embrace volunteerism and to determine what public service means for them. Justice LeRoy was called to the Bar in 1993, and practised as a criminal defense lawyer for 18 years before being appointed to the Ontario Court of Justice in 2011. She has served as a mentor to Western Law students through our January Ontario Court of Justice Placement Program, as well as through moot competitions, guest lectures, and panels. Michael Lerner LLB’72, a Bencher, brought greetings from the Law Society of Ontario. “More than any other profession, lawyers contribute more to their communities – whether it be by doing pro bono work or sitting on the boards of charitable or not for profit organizations,” he said. “It’s an expectation that you will give more than you will ever take back." Associate Dean Christopher Sherrin told the incoming students about their classmates interesting and diverse backgrounds. “Among you are Canadian Forces members, a homicide investigator, an assistant Professor of Sociology, professional musicians and published authors." He noted the new students have also volunteered their time with non-profit organizations, spiritual organizations, and at university in a wide variety of areas. “I accept the privilege and responsibility of becoming a law student at Western University. I support an environment conducive to the intellectual and personal growth of all who study, work, and live here.